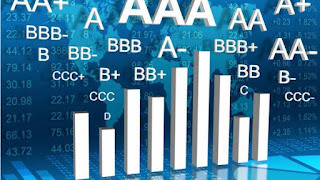 In this article we will study Credit Rating : Meaning, Need, Importance,Benefits and its Process. So we will discuss about its meaning, importance and why it is required in company and how it having major role to build confidence in investors. Credit rating refers to a process in which different Companies, financial institution or Agencies are analysed with financial instruments or financial entity. It is a rating given to a particular entity based on the financial entity and its workings are sound, in terms of borrowing and lending that has been done in the past. Credit ratings are determined by the credit rating agencies and it presents qualitative and quantitative information of a company or government. The credit rating is used by the individuals and entities that purchase the bonds issued by companies and Government to determines that government will pay its bond obligations. A poor credit rating of a company determines that company holding high risk and high rating determines less risk. 1). It analyse the credit worthiness of company or institution. 2). It maintain confidence of investors. 3).Protect the investors interest who can not into merits of the debt instruments of a company. 4).Motivate investors to invest in Industries or trade. 5). To analysis the value of company or institution. 6). Invitation to investors by issue of prospectus. (ii) Due to professional and trained staff, their ability of risk is better. (iii) Provide rating information to public. It provides information on low cost which helps public to certain level of risk and help in investment decision. If an instrument is rated by a credit rating agency, then such instrument enjoys higher confidence from investors. Investors gets helps from rating for better decision of investment. Higher credit rating to any credit investment tends to enhance the corporate image and visibility and hence it induces a healthy discipline on corporate. If the company get higher credit rating it means low risk and vice-versa. When credit rating agency rates a security, its own reputation is at stake. So it seeks financial and other information,and its financial and other representations acquire greater credibility. Public policy guidelines on what kinds of securities are eligible for inclusions in different kinds of institutional portfolios can be developed with greater confidence if debt securities are rated professionally. Helps in Investment Decision : Credit rating gives an idea to the investors about company standard in market and helps in decision of investing. So the investors can decide whether to invest in such companies or not. 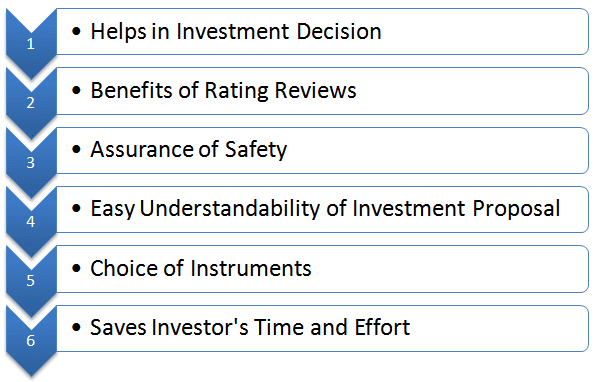 Higher the rating, the more will be the willingness to invest in these instruments and vise-versa. Benefits of Rating Reviews : The rating review helps investors in investing their money according to risk. S, if company get high rating it means low risk and vice-versa. Assurance of Safety : High credit rating gives assurance to the investors about the safety of the instrument and minimum risk of bankruptcy. This will protect them from bankruptcy. So the investors will be safe. Easy Understandability of Investment Proposal : The rating agencies gives different symbols of rating which is easy understand by investors or public. This helps them to understand the investment proposal of an issuer company. For e.g. AAA (Triple A), given by CRISIL for debentures ensures highest safety, whereas debentures rated D are in default or expect to default on maturity. Choice of Instruments : Credit rating gives choice of capital market instruments to public which protects their investment. This choice depends upon the safety or risk of the instrument. Saves Investor’s Time and Effort : Credit ratings save the time of investors by providing them different symbols of rating which means higher symbol means less risk or vice-versa and it also saves the efforts of investors. 1. Lowers Cost of Borrowing : Companies high credit rating will enable the company to offer low interest rates on fixed deposits, debentures and other debt securities. The investors will accept low interest rates because they prefer low risk instruments. High rating means low risk and vice-versa and investors accepts it. 2. Wider Audience for Borrowing :If the company get high credit rating for rating agency most of the audience are interested to invest on it. A company with high rating for its instruments can get a wider audience for borrowing. It can approach financial institutions, banks, investing companies. 3. Good for Non-Popular Companies : Credit rating is beneficial to the non-popular companies, such as closely-held companies. If the credit rating is good, the public will invest in these companies, even if they do not know these companies. 4. Act as a Marketing Tool : It act as marketing tool which helps in developing confidence of customers. Credit rating not only helps to develop a good image of the company among the investors, but also among the customers, dealers, suppliers, etc. 5. Helps in Growth and Expansion : Credit rating enables a company to grow and expand. This is because better credit rating will enable a company to get finance easily for growth and expansion. 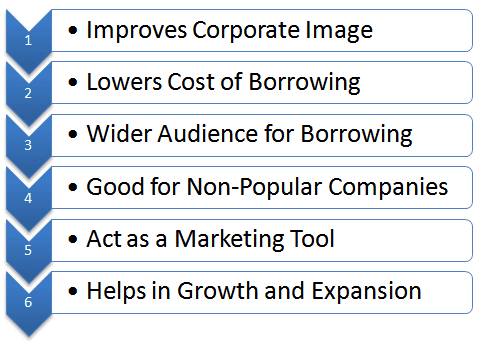 6.Improves Corporate Image : Credit rating helps to improve the corporate image of a company. High credit rating creates confidence and trust in the minds of the investors about the company. Therefore, the company enjoys a good corporate image in the capital market. Benefits and its Process slideshareBenefits of credit rating to investors and to companiesbenefits of excellent creditbenefits of good creditChart of credit ratingcredit ratingCredit Rating : Meaningcredit rating agencies definitioncredit rating by crisilcredit rating companies in indiacredit rating companies in Mumbaicredit rating default probability tablecredit rating for individuals in indiacredit rating frameworkcredit rating guidelinescredit rating meaning importance need and benefits notes in hindicredit rating meaning importance need benefits and its process notes for b.com BBA and MBA students for download pdf pptcredit rating notes on advantages and disadvantageHow credit rating protect investors interesthow to improve credit rationimportance of credit ratingImportance of credit rating in companiesneed of credit ratingshow a credit rating workshow credit rating maintain investors interest and helps in decisionstate credit ratingsthe quality of your credit rating is maintained byuseful ways to build a strong credit ratingwhat are the benefits of good creditwhat is a good credit ratingswhich of the following does not require you to have a good credit rating to issue you a loanWhy credit rating is known as marketing tool.